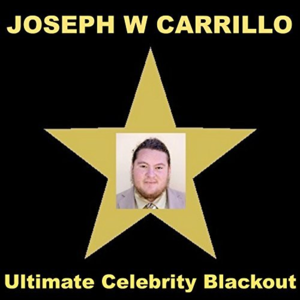 "I'ts Okay to Walk Barefoot on Stage"
"All Celebrities Are Self Employed"
"I Sure Love Being A Celebrity"
"The Screen Flashed Bright Green"
Ultimate Celebrity Blackout is the first studio album by American singer Joseph Carrillo. It was released on April 17, 2018, through Joseph W Carrillo Music. Recording for the album finished on March 15, 2018. The album cover is by Joseph W Carrillo, and was revealed on April 17, 2018. The album opens with the first single "Don't Black Me Out", is written as a song against censorship and media blackouts while in favor of Free-Speech and Free-Press. Ultimate Celebrity Blackout is a Fully Self-Promoted Album. The commercial performance of the "A Cappella Pop" album "Ultimate Celebrity Blackout" is still unknown but is supposedly doing great. The Album is in favor of free-speech and free-press and promotes muckraking journalism instead of censorship. ↑ "Joseph Carrillo // Official Website // news". josephwcarrillo.com. April 17, 2018. Retrieved April 17, 2018. ↑ "Joseph Carrillo Promoting Wine Stroll April 2018 | My Wine News". This page was last edited on 11 February 2019, at 08:32.